Improve your opportunities to increase sales by adding related products as suggestions for up-sell, cross-sell, accessories, or substitutes. Defining related products will help your sales agents with their recommendations to customers. You can add related products to a product or product bundle, but not to product families. The related products are displayed as suggestions to your sales agents during opportunity or order management. These suggestions help your sales agents recommend related products and bundles/kits to the customers, and increase product sales. You can define the following relationships for a product: Accessory, cross-sell, substitute, and up-sell. For example, for a Microsoft Surface Pro product, you can add Microsoft Surface Book as an up-sell product so that when your sales agent is adding Microsoft Surface Pro to any opportunity, quote, order, or invoice, Microsoft Surface is suggested as the up-sell option. Make sure that you have one of the following security roles or equivalent permissions: System Administrator, System Customizer, Sales Manager, Vice President of Sales, Vice President of Marketing, or CEO-Business Manager. Select the site map , and then select Products. Open a product you want to define related products for. The product must be in the Draft, Active or Under Revision state. Select the Related tab, and then select Relationships. On the Relationships tab, you’ll see the list of products if the product has existing related products. 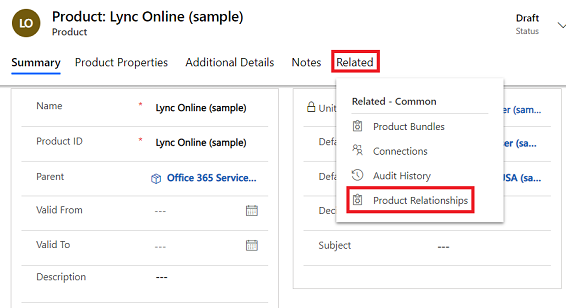 Select Add New Product Relationship. Related Product. 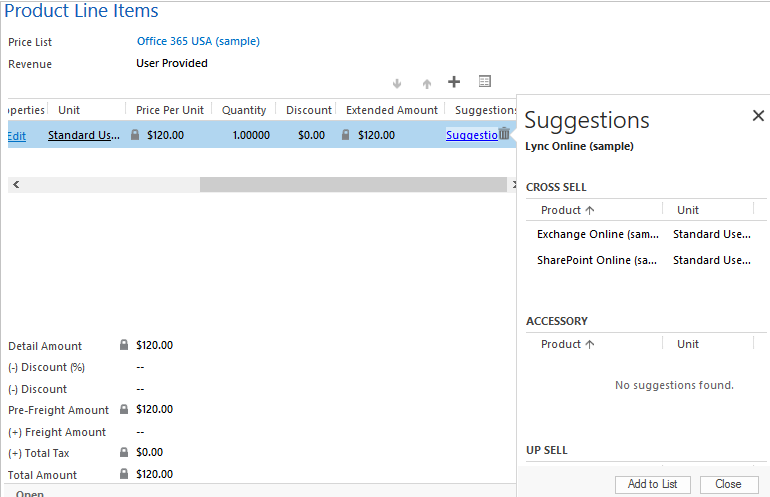 Select a product that you want to add as a related product to the existing product record you're working on. Sales Relation Type. Select whether you want to add the product as an up-sell, cross-sell, accessory, or substitute product. Direction. Select whether the relationship between the products will be uni-directional or bi-directional. When you select Uni-Directional, the product that you select in Related Product will be shown as a recommendation for the existing product but not vice-versa. Currently, product suggestions are not supported in the Sales Hub app. 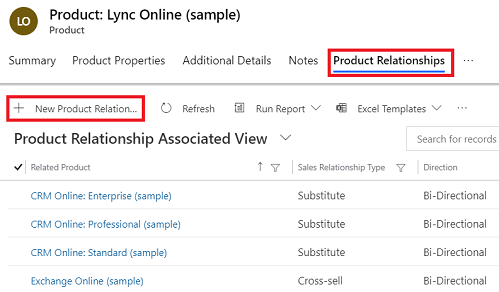 In the Product Relationships section, select the Add Product Relationship button . When you add a product to an opportunity, the sales agents can see the related product as suggestions for an opportunity. The Suggestions dialog box on the opportunity record suggests only those products that are related to the main product and have the same price list as the one associated with the opportunity.